Home / What to do on a gray Saturday? A group of us decided to spend the day together in the shop on Saturday learning Kumihimo. It was such a gray day and we needed an extra dose of color. 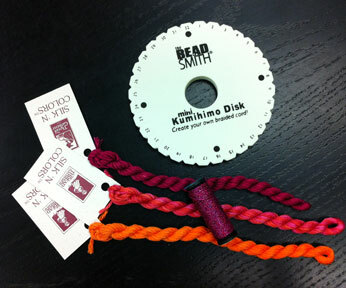 Kumihimo is a Japanese braiding technique that is really quite simple. You work with a foam disk that has numbered slots on it to tell you where to place your threads. There are a few simple movements. Repeat this many times and a braid begins to appear. I found this video on youtube that shows how it’s done. 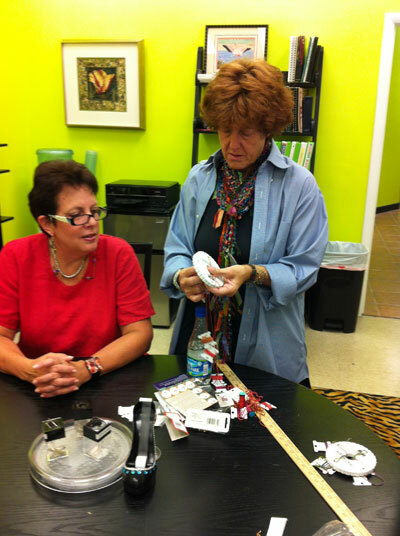 Linda Rosenthal was our instructor. 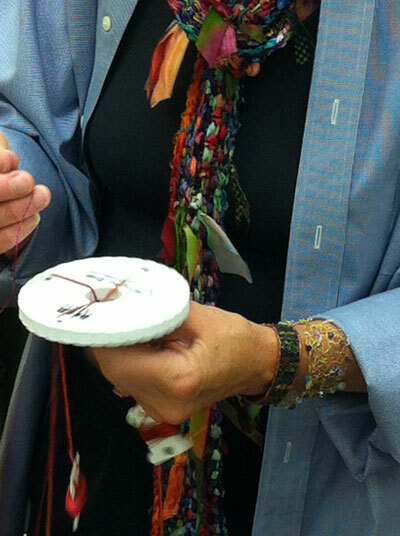 She is an accomplished photographer and fiber artist. She is full of the joy of creating and happy to share what she knows. She kept us all in line. Including me as I seemed to be totally challenged at the beginning. We each selected our own color palette. Imagine that, mine is raspberry and orange. 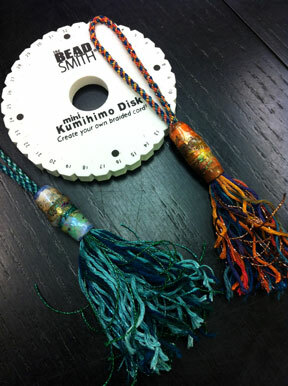 By the end of class with the magic of paper beads made by Linda, Cleta and Wendy had finished tassels. 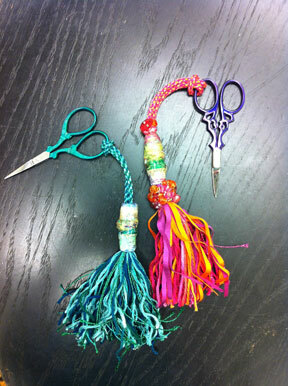 We looped some on to scissors and instant scissor fobs were born. Mine is the crystally one. You probably could have guessed that. Maybe I was a flamenco dancer in a previous life? Oh wait, that would require rhythm. That’s not happening. The crystals hide a multitude of sins. They were all leftovers from other projects and they needed a good home other wise I would be forced to put them away. I just kept sewing on crystals till they were all used up. Kinda fun, no rules, totally random. Thanks again, Linda. We had a great time! This is awesome. I wonder how i might learn to do that? Where can u get those? The tassels are lovely!